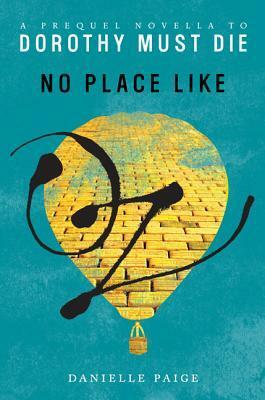 Veering slightly off the track of my trajectory of books for the year, I couldn’t help but read No Place Like Oz, the prequel e-novella by Danielle Paige, as soon as I caught wind of it. I was fortunate enough to have the pleasure of meeting her and listening to her talk about her (now New York Bestselling) book Dorothy Must Die at my local bookstore, The Odyssey. This year marks the 75th anniversary of one of my favorite franchises of all time. I mean favorite. I’m talking: I had a Wizard of Oz birthday cake, y’all. FAV. Over the years, Baum’s books have been adapted countless times, and I would say that this newest addition to the world does not disappoint. Thankfully, I can launch myself directly in to Dorothy Must Die without having to wait. Though I haven’t finished many of the original Baum books, I have completed the more popular of the stories, which is where Paige’s books draw their inspiration. This prequel brings us back into Dorothy’s life a few months following her return to Kansas. Though she’s been happy to get home after all of her adventures, she has gotten a bit stir-crazy knowing that there’s a whole world out there beyond dusty old farmlands. On her sixteenth birthday she receives a mysterious package containing fancy red heels that end up transporting not just her, but also Uncle Henry and Aunt Em to Oz. Once there, she resolves to never return to Kansas, despite her family’s protests, and to reunite with her old friends. Instead, she ends up spending much of her time at the Emerald City and becomes the acquaintance of the new ruler, Ozma…. And I won’t spoil anything else — but it’s good! In this little novella, we see quite a development in the character of Dorothy, from a very familiar “oh-fiddle-dee-dee” corn-fed girl to… well… I won’t ruin it… But trust me on this: it’s worth the read. This, so far, seems like the perfect primer for the full-length Dorothy Must Die, and at a very reasonable $1.99 from Amazon’s Kindle Store, it’s worth the buy. You can bet I’ll be writing about Dorothy Must Die when I finish that, too. Next > BEA – Books Everywhere…Ahhh!